than incorporating lots of delicious chocolate in your special event! into the soft velvety chocolate fountain! 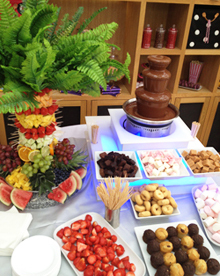 there is always room for a chocolate fountain! as a healthy alternative to your party. 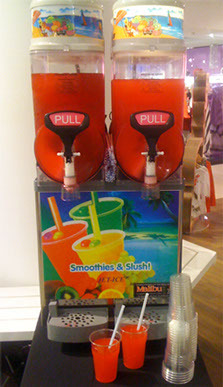 Our SLUSH MACHINES will be a big hit with your guests, we can supply Slush Machine, Slush Syrup , Cups and Straws…….. you could even add your own alcohol to really get the party flowing. We can provide table top POPCORN WARMERS supplied with freshly made popcorn and cones to serve. EVERYONE will love the aroma and taste! Table Top SCOOP ICE CREAM FREEZER comes with Ice Cream of your choice, cones, Tubs, Sprinkles , Flakes, and sauces. Perfect for hot summer nights. Hotdogs with Condiments / Napkins / Plates and Cutlery / Slush Machine / Popcorn Warmer / Scoop Ice Cream / Candy Floss Bags. We can supply our services with an attendant or you can hire the equipment too. We also cater for wedding anniversaries, house warming parties, birthday parties, engagement parties, bar mitzvahs and so much more!